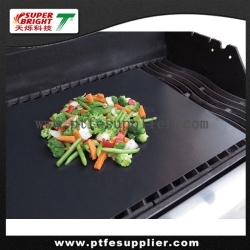 PTFE Oven Liner, made of PTFE coated fiberglass, is typically designed for ovens and microwaves. No mess, clean, green, eco-friend, healthy life and energy day. These are the main purpose that we want to share with your friends and families. 2) Cut into size with scissors to fit your ovens or microwaves. 3) Place the liner on the bottom of your ovens. 4) The liner is now protecting the bottom of your oven. 5) What you need to do is to clean the liner after baking. 2) Don't bend or corrugate. 3) Never put the non-stick oven liner on the floor of the oven, but always on the bottom rack! 4) Don't heat over 260 °C or directly contact with the flame or the heating element. 5) Do not cover ventilation holes of the oven (gas oven).